The St. Vincent dePaul Society (Société Saint Vincent de Paul) was created in France in 1833 by Frédéric Ozanam to help poor people living in the slums of Paris. 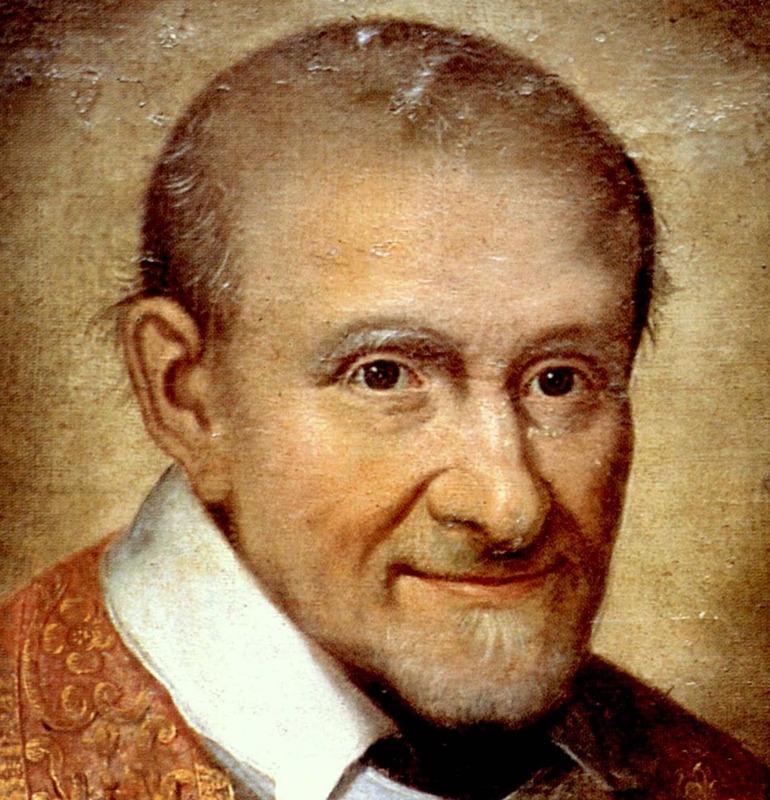 The Society is part of the VIncentian family, which includes amnog others two orders formed by St VIncent de Paul himself for the service of the poor. The American branch of the society was created in 1845 in St Louis, MS. The Society has 800,000 members in 140 countries around the world. The Society, a Catholic lay organization, is over 100 years old and was founded on the tradition of its founder, Blessed Frederic Ozanam, and patron St. Vincent dePaul to service those who are in need. Locally we provide food vouchers to the local market, sometimes supplementing the vouchers with non-perishable items from our food pantry which our parishioners donate to eachmonth. We have helped with fuel for some elderly, helped with paying utility bills, and can be a source for seeking other aid. Through the Boston Conference, we have been instrumental in awarding scholarships to several students in Our Lady’s Academy. Our Lady's St. Vincent dePaul Society helps the needy of our parish. Below please read some information on the various ways we help those in need: food pantry, clothing drives, the annual Christmas Giving Tree and more. Please contact our St. Vincent dePaul Society if you or someone you know needs help. All calls are confidential. You may call the parish office at 781-894-3481 x2 or email us at stvincentdepaulolca@gmail.com and one of our members will contact you. The food pantry is stocked because of donations made on the third weekend of each month by parishioners who want to help those in need. Requested donations are tuna fish, mayonnaise, jars of pasta sauce, small canned hams, peanut butter, jelly, cans of spaghetti O’s or ravioli and children’s snacks. These items can be left in the designated baskets at each door of the church. A sincere word of thanks to all who continue to support the food pantry, which helps us fulfill the mission of St. Vincent dePaul in their efforts to assist the less fortunate of the parish. We are grateful for your contributions each month. The weekend after Thanksgiving, index cards are hung on Christmas trees in the back of the church. Each card identifies a person in need and indicates his/her age, gender, clothing size, and suggested gift idea. If you wish to participate in this program, please take a card, purchase a gift, wrap it, firmly affix the index card to the outside of the package, and bring the gift to church on the weekend designated in the bulletin. Please note that no gift should exceed $30. Please respect the fact that the gifts needs to be returned ontime because of specific pick up times by various groups. If you don't have a chance to get a card from the tree, we would welcome a gift card to perhaps Hannaford's or Market Basket, TJMaxx or Marshall's, or CVS. We will use these to replace a gift request that doesn't get fulfilled. If you take a card and cannot make it to Mass on the collection weekend, you can drop your gift off at the Parish offices anytime before then, but please no later than noon on the Sunday of collection, because all the gifts will be distributed that afternoon. Also, if you take a card and for some reason cannot provide a gift in time, please bring the card back to the Parish office or call the office (781-894-3481 x2) with the card's code number. Our St. Vincent de Paul conference has enrolled with the AmazonSmile program to supplement its treasury. This program is set up for people to shop on Amazon just like normal, but the only difference is they use the address smile.amazon.com instead of www.amazon.com. It’s that simple. There is no additional cost to the buyer. If a user of AmazonSmile has us designated as their charity, we will receive 0.5 percent of each purchase, which doesn’t include shipping and taxes. That amount might not seem like much, but it can add up if enough people participate. Our unique charity link is: https://smile.amazon.com/ch/27-3630089. Please use this link when shopping on Amazon. This will assure that the Our Lady Comforter of the Afflicted conference will be properly credited with the donation and not be confused with other organizations. Please share this with your friends and family and encourage them to use the unique charity link above. If you have any questions, please email them to stvincentdepaul@olca.org. St. Vincent dePaul sponsors the clothes bin on the Belmont side of the church parking lot. Please remember only clothes are allowed in the bin. Fall is “clean out your closet” time, and remember that any gently used clothing can be dropped off in the St. Vincent de Paul box located on the Belmont side of the church parking lot. THANKSGIVING DINNERS Annually, we deliver Thanksgiving baskets to those whom we have serviced throughout the year, sponsor a “Baby Shower” to collect infant and childrens items for local shelters, and our annual Christmas Giving Tree where we deliver over 450 gifts to local families and Catholic Charities. To find out more information about St. Vincent dePaul Society, please go to the National Council of the United States Saint Vincent de Paul, Inc. Also, please see the Society of St. Vincent de Paul in the Archdiocese of Boston. If you are interested in becoming a member, we would love to hear from you.